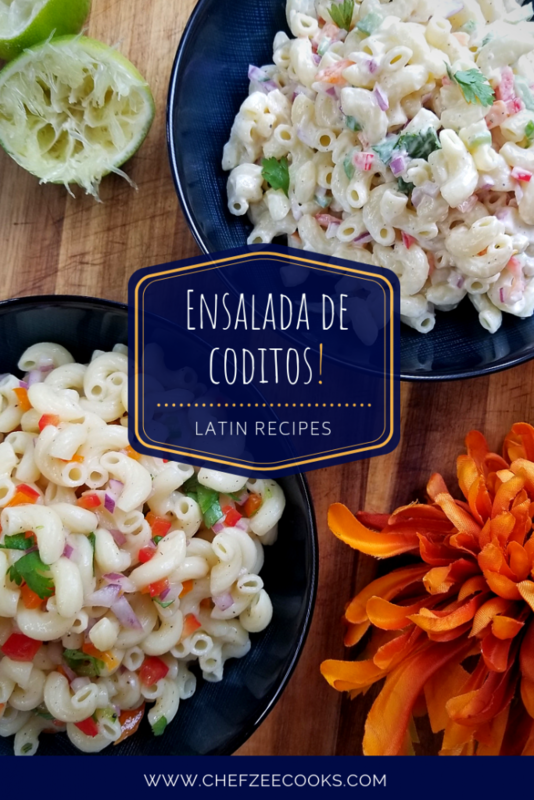 Ensalada de Coditos is a Macaroni Salad that you can make a variety of different ways. In fact, I make two different ways each and every single time that I make it simply because my family is always split between those who like it with mayo and those who like it without mayonnaise. Nonetheless, the varieties don’t stop here. You can add ham, shrimp, tuna, chicken and more to your Macaroni Salad and still end up with an amazing dish! Now whether you’re team Mayonnaise or Team No-Mayonnaise, Ensalada de Coditos is a side dish that you can whip up in minutes. However, you do want this salad to settle in the fridge for a few hours. Trust me! The flavors come together super nicely especially since I love infusing my Macaroni Salad with tons of fresh lime juice. Funny enough, it wasn’t until I shared my YouTube Video on How to Make Ensalada de Coditos | Macaroni Salad TWO Ways that I realized that many people hadn’t actually free-styled this dish. Most people enjoy this Macaroni Salad with Mayonnaise– and with good reason, but this salad is also delicious without mayo. If you’ve ever tried my Tuna Fish Salad then you know exactly what I’m talking about. 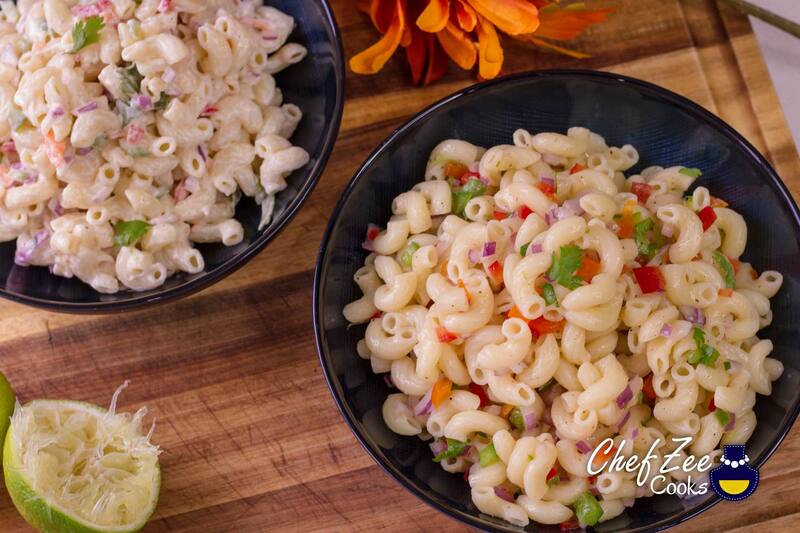 My non-Mayo Macaroni Salad is drowned with fresh lime juice, onions, peppers, cilantro, and olive oil. It’s refreshing and crisp much like a summer’s night. You can enjoy this salad year round and best of all, vegans in your family can rejoice. This salad is for them! While I go back and forth between the two salads, the non-Mayo version has a special place in my heart. My aunt Angela is the Queen of soups and salads. I got this recipe from her and no family gathering is complete without her colorful salads. While I did use Macaroni to make this salad, feel free to use whatever pasta that you like. The colorful rotini and bowties are two of my favorite pastas to use as well. I personally like to boil them al dente but you can boil them to whatever softness that you like! Now you probably grew up eating Ensalada de Coditos with mayonnaise. It’s a traditional dish that changes household to household! Some don’t add lime while others love adding hame, seafood, or chicken. Since my Tia Angela doesn’t eat Pork, we always had her classic Macaroni Salad with no ham. As I grew older and began experimenting on my own, I grew to appreciate add-ons into my Ensalada de Coditos. Nowadays, I keep it simple and stick to the two versions that my aunt mostly made. It’s a bit of nostalgia and helps keep tradition going. When making Macaroni Salad with Mayonnaise, remember to add a little bit at a time. It’s easier to always add more mayonnaise if needed than take some out. You also want to use a brand of mayonnaise that you absolutely love since this will also be a major component of flavor. The worst is to make a Macaroni or Potato Salad with a brand of Mayonnaise you’re not particularly fond of. It ruins the whole dish! Now just like the non-Mayo version, you also want to let this Ensalada de Coditos sit in the refrigerator for a few hours. Remember, this Macaroni Salad is JUST like the non-Mayonnaise version with only different being the creamy mayo. Feel free to make this salad a day or two ahead and serve chilled. You can also serve this at room temperature. The decision is entirely up to you. If you’d like to see a step-by-step video on How to Make Ensalada de Coditos | Macaroni Salad TWO Ways, visit my YouTube Channel: Chef Zee Cooks! Don’t forget to Pin this yumminess to your boards!